Welcome back to IHB Carrie! We must give this lady some mad props as she finished and sent me her content while taking care of her mom who underwent an emergency appendectomy while visiting her in the city of brotherly love! Big hugs to my friend on the East Coast and sorority snaps for this great organizational tip! It doesn’t have to be springtime to get your “spring cleaning” on. In fact, I’d rather get all that cleaning, organizing and purging done before spring comes, so I can actually enjoy the change in season. Pinterest is such a great resource for finding creative ideas to clean out and simplify your life and home. I found a great inspiration from Julie Dinn over at Kreative Jewels. She stores all if her craft ribbon by rolling each spool of ribbon around a craft or popsicle stick. 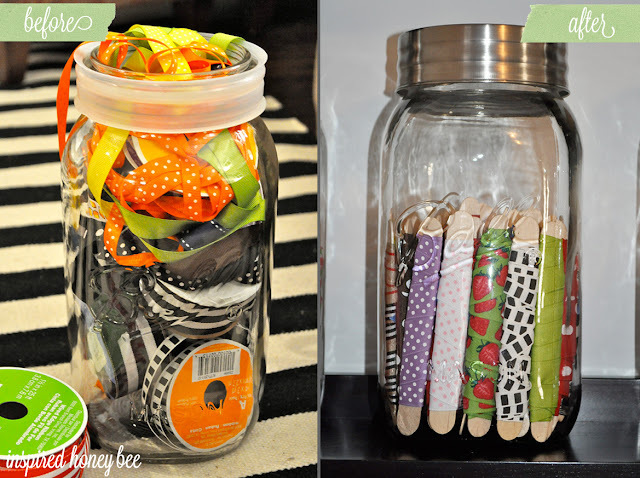 This is such a great space saver as well as a cute way to display what you have. Such a great idea! THAT is genius! Just added to may craft area to-do list! This is a cute idea. I have rolled some of mine around the old round clothespins. Like this look too! Thanks for sharing with Share Your Cup. Such a fun idea! I am featuring it today, here is the link: http://www.somewhatsimple.com/5-creative-organization-ideas/ Thanks for linking it to my link party!